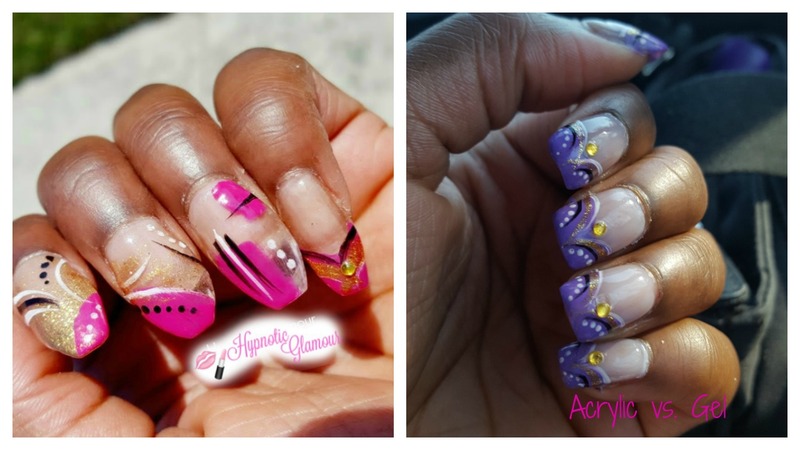 Hypnotic Glamour Beauty Blog: Acrylic Vs. Gel...Which is Better? Acrylic Vs. Gel...Which is Better? Earlier last year, I got back into doing acrylic nails again after not doing them for about 6 years. I've been thinking a lot about the differences, pros vs. cons, etc and decided to discuss it here. Self leveling - Gel automatically forms to the shape of your nail and makes a smooth surface. This leaves you with little to no filing time. Less strong chemical smell - While gel does still have a distinctive smell, it's not nearly as powerful as acrylic. Flexibility - This makes the gel more difficult to break and easier to clip if you want to change the length or shape. Viscosity - Gel is very runny so you can easily make a mess if you're not careful. Lamp required - Since gel doesn't cure on it's own, you'll have to purchase a lamp to use. Under Cure - You think you cured your nail long enough but turns out it's not and the gel is still malleable and susceptible to rips and tears. Cost - Gel cost quite a bit more to buy than acrylic does and as mentioned above, you will also have to buy a lamp. Ease of use - Proper application is really simple and easy to learn. No lamp required - Just give it a few minutes and it'll cure on it's own. Faster - Acrylic sets don't take as long because you don't have to keep putting your nails in and out of a lamp. Tedious to soak off - Acrylic takes much longer than gel to soak off nails and many times you'll have to repeat the process to remove it all. Difficult to master - I only say this because it takes time and patient to get down the proper liquid to powder ratio. Dulls nails - They're not very good for scratching an itch since they are not sharp at all. So here is my list based on my experiences. Please, share yours in the comments below!